These Hama bead Easter Eggs are made using the Easter Egg pegboard, a really versatile board which I've been using lot for Easter crafting lately - a few years ago we made some Hama bead and paper plate decorations and I've recently been using the board to make Easter egg frames. You can use the board to make eggs in all different sizes, which is what inspired these layered up designs to create 3D eggs. In order to save beads, the 3D Easter eggs are made using a series of three shapes which overlap by one bead to allow them to be glued together. To glue them you can use any type of glue, I tend to use white PVA glue which sticks them together well. 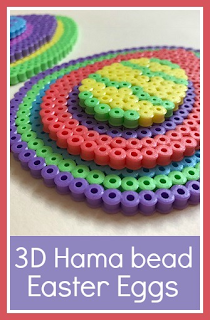 I've used beads from our box of 10,000 pastel Hama beads (affiliate link). This box has a great selection of beads in six pastel colours, great for Spring crafting and a nice contrast to the solid colours. These boxes vary in price widely over time so it's worth keeping an eye out as they can be fantastic value if you catch them on special offer - I always stock up when they are! The finished eggs would look great hung up as a decoration - you can use the hole in the top to thread through some string or ribbon. If you make lots they would also be fun to hide around the house for an Easter Egg hunt. 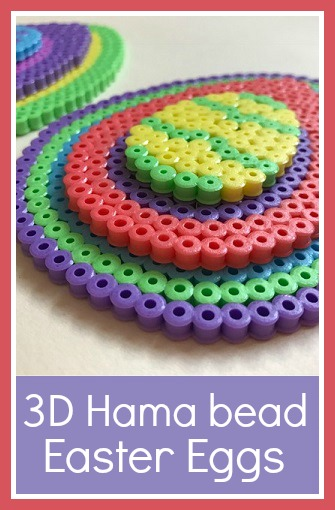 You can find plenty more Hama bead designs on my Hama bead page.